New confirmation of the rendering capabilities of CPU over GPU with increased performance from Intel® Xeon® processor E5-2699 v4 and KeyShot’s ability to utilize 100% of all available cores. Tustin, California, May 4th, 2016 – Luxion, a leading developer of advanced rendering and lighting technology and maker of KeyShot®, the first real-time ray-tracing and global-illumination program for 3D rendering and animation, today confirmed the performance increase and rendering powering of CPU over GPU provided by the new 22 core Intel® Xeon® processor E5-2699 v4, delivering unmatched framerates and higher render speeds through KeyShot’s advanced rendering capabilities. KeyShot users on both Mac and PC rely on KeyShot for a faster rendering and animation workflow and the ability to scale their performance linearly without the constraints of dedicated graphics. Through the 14nm process technology and expanded cache, memory size and bandwidth of the new Intel® Xeon® processor E5-2699 v4, KeyShot users gain more CPU power within the latest-generation server configurations and cloud environments. With two Intel® Xeon® processor E5-2699 v4, each with 22 cores (44 threads) for a total of 44 cores (88 threads), Luxion benchmarks reveal a more than 20% increase in performance over previous generation Intel® Xeon® processor E5-2699 v3 with 18 cores (36 threads). 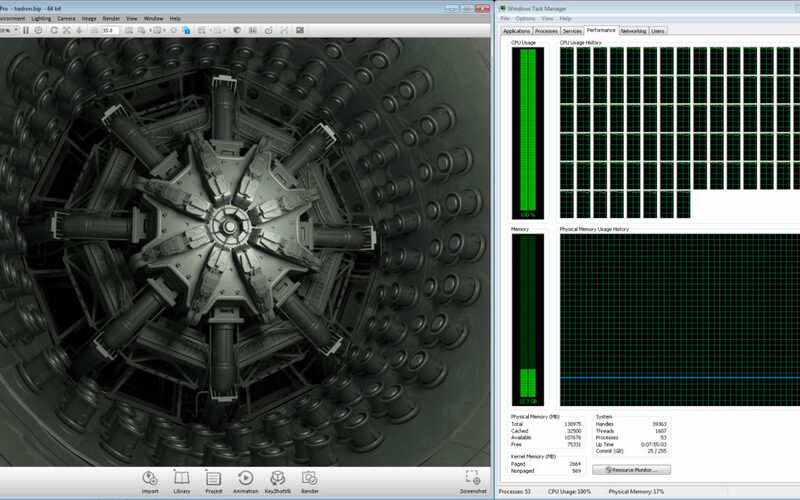 Test of KeyShot with the Intel® Xeon® processor E5-2699 v4 reveals higher frame rates and KeyShot’s utilization of 100% of all CPU cores. 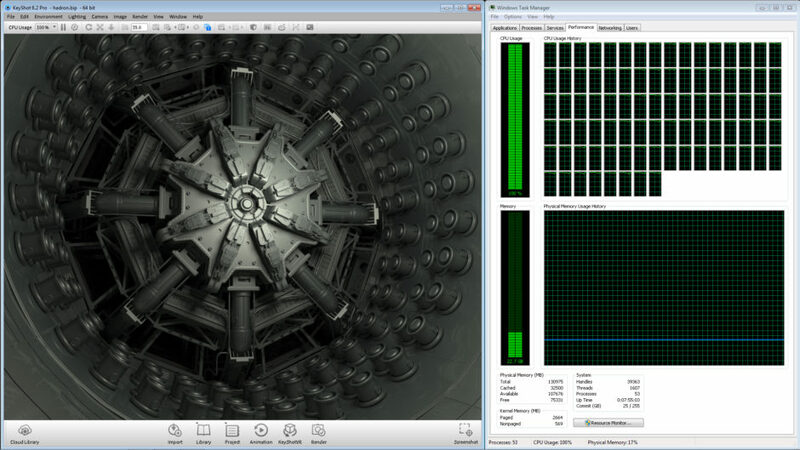 Dataset: 120 million poly Large Hadron Collider model created by David Schultz. KeyShot is able to fully utilize the 44 cores (88 threads) offered by the new dual socket CPU processor configuration, demonstrating KeyShot’s strength as a highly capable rendering solution for working with advanced lighting scenarios and complex data sets. Furthermore, KeyShot has the unique ability to render the data directly as NURBS without having to use an approximate triangle representation. Additionally, the Intel® Xeon® processor E5-2699 v4 supports more than 1TB (1000 GB) of memory, which enables KeyShot to render models with extreme levels of complex geometry. On May 5th, 2016 Luxion will host the first annual KeyShot RenderWorld in Anaheim, California. With sessions, workshops and networking opportunities, the event allows KeyShot users from around the world to learn how others are using KeyShot throughout the product development process. During the event people will have the opportunity to see the power of CPU-based rendering with the Intel® Xeon® processor E5-2699 v4 in a dual-socket configuration for a total of 44 cores (88 threads). Additionally, Henrik Wann Jensen will be speaking at the conference on the future of KeyShot and 3D rendering technology. Please visit keyshot.com/renderworld/ for more information. Luxion is a leading developer of advanced 3D rendering and lighting technology including applications such as KeyShot and the Velux Daylighting Visualizer. KeyShot is the first real-time ray tracing application that uses a physically correct render engine based on scientific research in global illumination and material appearance. With a focus on making the creation of high-quality visuals from 3D data as simple as taking a photograph, KeyShot is recognized as the standard visualization tool for industrial designers and marketing professionals worldwide. Luxion’s customer list includes many of the Fortune 1000 and major industrial design companies including Caterpillar, Chrysler, Fossil, Microsoft, Philips, Sonos, Specialized, and Whirlpool. For more information on KeyShot 3D rendering, animation and KeyShotVR, please visit keyshot.com or follow us on Facebook or Twitter. Intel and Xeon are registered trademarks of the Intel Corporation in the U.S. and other countries. KeyShot is a registered trademark of Luxion ApS. All other company and product names may be trademarks of their respective owners.